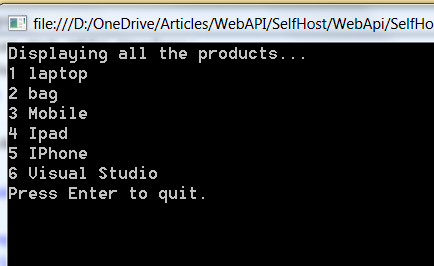 But we’ll do hosting for WebAPI 1 and will not make use of Owin for this application. Step 1 : Create Console Application. We’ll add a WebAPI controller to it and write code for CURD operations, but before that we need the database and a communication for performing database transactions.I’ll use EntityFramework for database transactions. You can create any database you want. 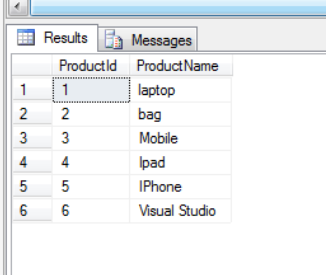 I am using SQL Server and will create a database named WebAPIdb having a table named Products for performing CURD operations.There are more tables in this database but we’ll not use them. So we are done with database creation , now let us setup the entity layer for communication. I’ll install Entity Framework 5.0, as it works well with .Net Framework 4.0. So select SelfHostedAPI as Default project and type command Install-Package EntityFramework –Version 5.0.0 and press enter. 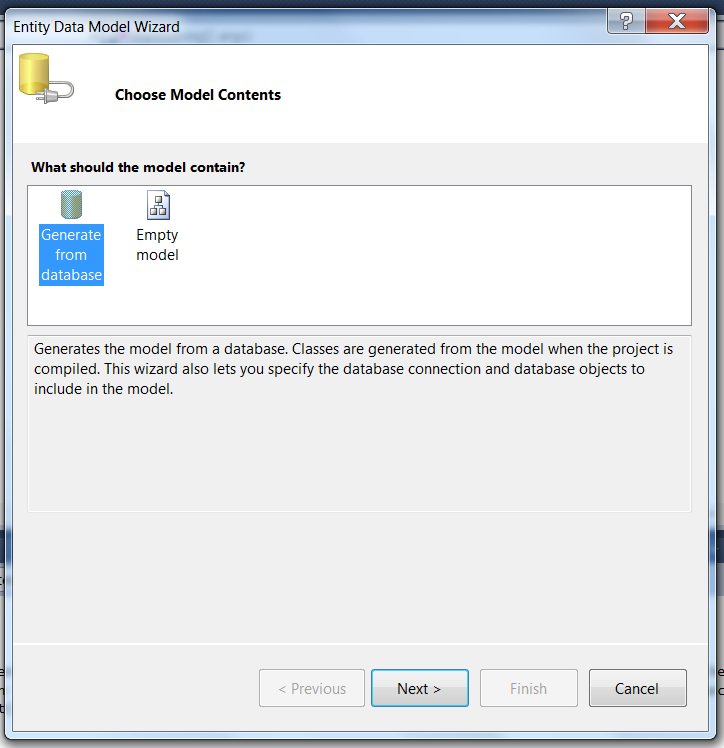 Once installed successfully, you’ll see Entity framework dll added to your project. Now right click your project and add the new item. 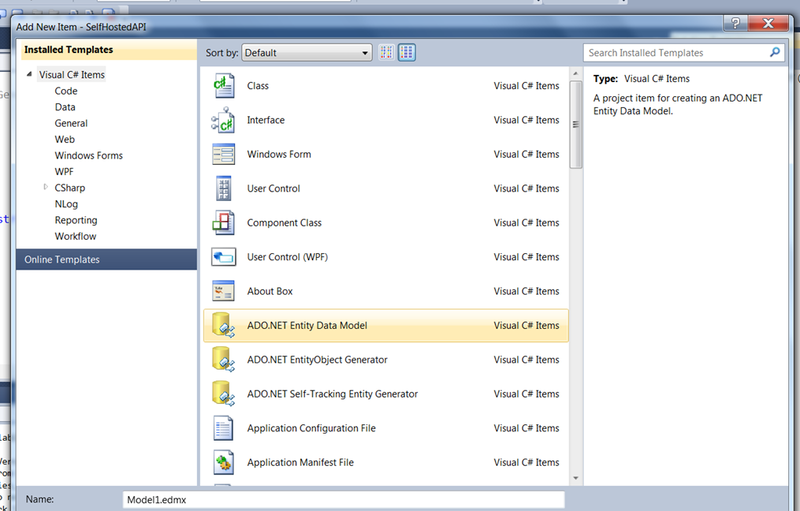 Select ADO.Net Entity Data Model from a list of Visual c# items. You’ll be prompted with options to generate a model. Choose Generate From Database option and proceed. 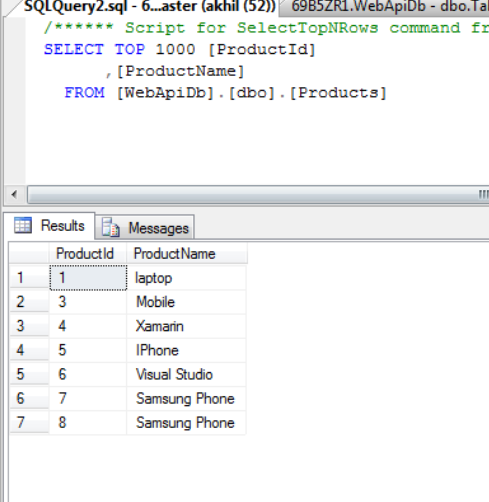 After providing database details in the next step, choose database tables that you want to map with the model. I have only selected products table as we’ll perform CURD over this table only. 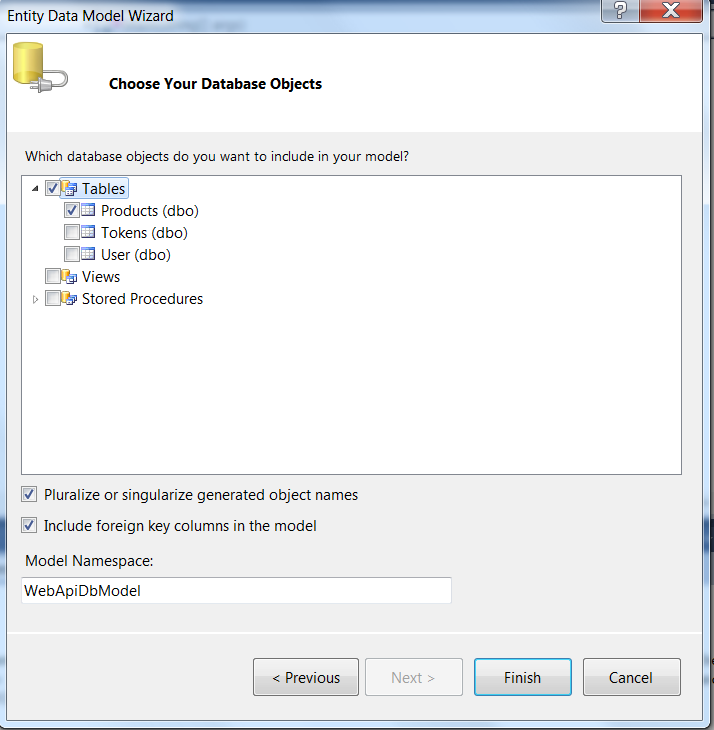 Click on Finish and your Entity Data Model will be ready with your database tables mapping. You’ll see that an App.Config file is generated and a connection string specific to the selected database is added to that config file. Now we need to generate object context that handles transactions and objectset acting as model classes mapped to the table. 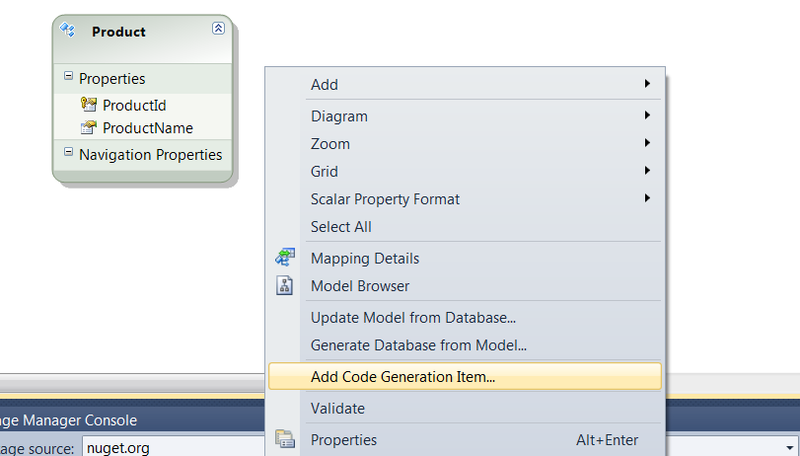 Right click on your edmx view and in the context menu , click Add Code Generation Item. 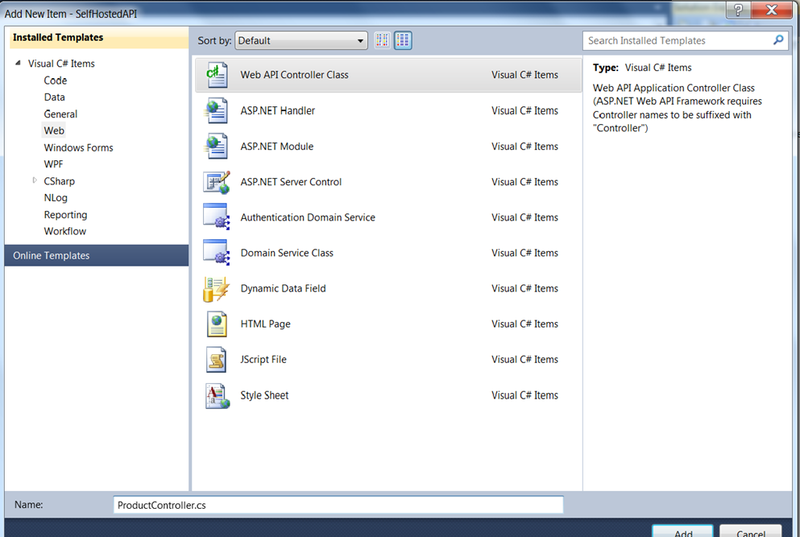 In the open window for the list of items select ADO.NET EntityObject Generator like shown in below image. Select this and press OK, this will generate your Model1.tt class containing context and entities in the same class. Now we are done with all database related stuff.I’ll now create a WebAPI controller and in place all CURD operations in it. Since we need an API where we can perform all CURD operations on our database, we have to add a WebAPI controller class in the project. Since this is a console application and not a WebAPI project, so we don’t have a proper structure defined for adding the controller. you can create your own folder structure for the sake of understanding.I am directly adding an API controller class named ProductController in the project. 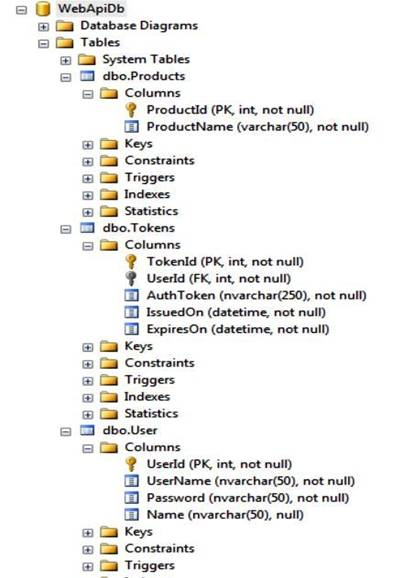 We’ll make use of these default methods but write our own business logic for DB operations. We’ll add all the four methods for Create, Update, Read and Delete.Note that we’ll not make use of any design pattern like UnitOfWork or Repository for data persistence as our main target is to self-host this service and expose its CURD endpoint. Modify Get() method to return a list of Product entities and make use of WebAPIEntities class generated in Model1.cs file to get the list of products. The method name here signifies the type of method as well, so basically this is a Get method of the service and should be called as method type get from the client as well. Same applies to every method we write here in this class for all CURD operations. in the above-mentioned code base we return IEnumerable of product entities and use object of WebApiDbEntities (auto generated context class) to fetch all the objects using entities.Products. Modify Get(int id) method to return a product entity.The method takes an id and returns the product specific to that id. you can enhance the method with validations and checks to make it more robust, but for the sake of understanding the concept, I am just doing it straight away. As the name signifies, this is a Post method , that fetches a Product class object from a body of the request and adds that product into entities.Note that your product will be added to the actual database only when you execute entities.SaveChanges(). This method actually inserts your record in the database and returns 1 in the case of successful insert else 0. Since this is an update operation, we name it as Put method, and as the name signifies, it is of PUT type. The method takes id and product object as an argument, where first an actual product from the database is fetched having an id that is passed as an argument and then that product is modified with the details of parameter product and then again saved to the database.In our case, we have the only product name that could be changed because id is fixed primary key, so we update the product name of a product in this method and save changes to that entity. The above-mentioned delete method is of DELETE type and accepts id of the product as a parameter. 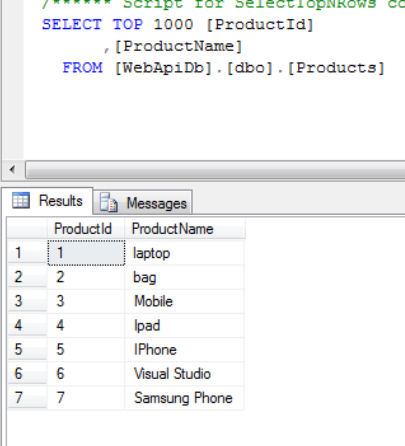 The method fetches product from database w.r.t. passed the id and then deletes that product and save changes. the implementation is pretty simple and self-explanatory. 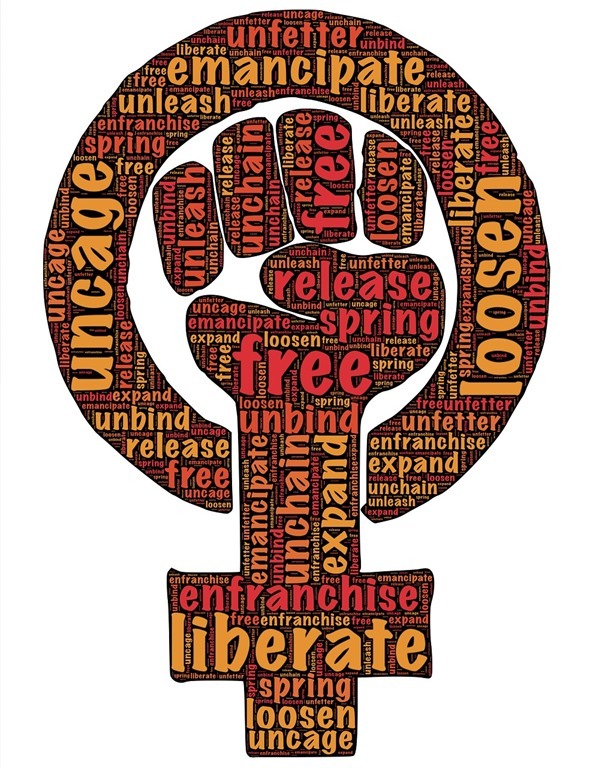 Here comes the most important piece of this post, “self-hosting”. Remember when you created SelfHostedAPI project, it was a console application and so it came with a Program.cs file created within the project.The Program.cs file contains the main method i.e. entry point of the application. 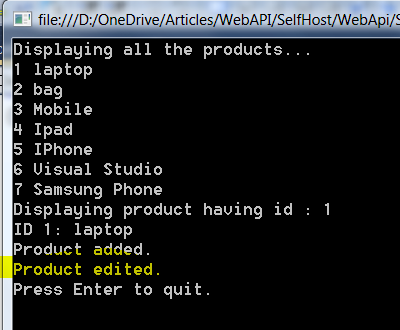 We’ll use this main method to write self-hosting code for our WebAPI. 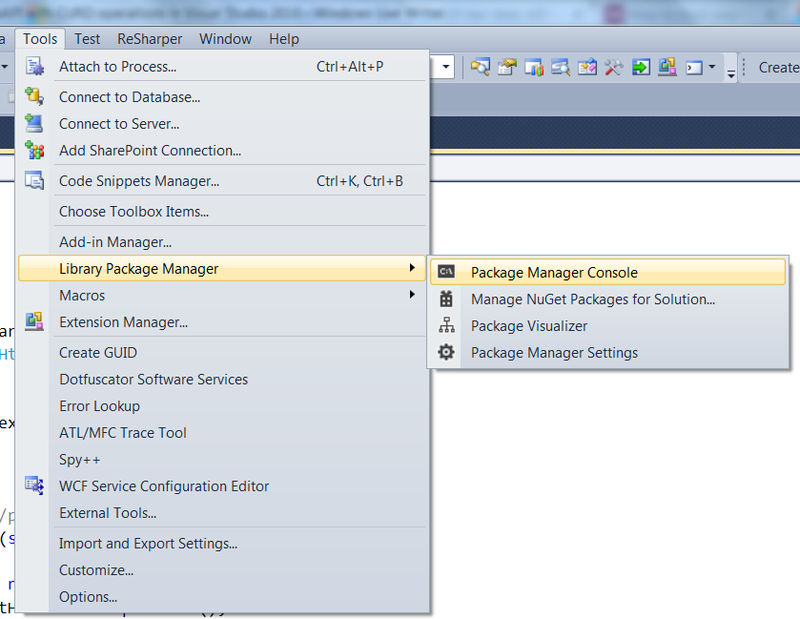 Before we write any code we need to add a NuGet package through Package manager console. This package contains hosting specific classes required to host API in console application i.e. 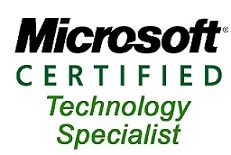 independently in a separate process other than IIS. 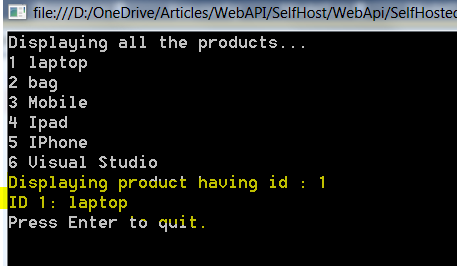 Note that in WebAPI 2 we have Owin middleware that provides this flexibility. This installs the package for your project and now you can use it for implementation. This is the default route that our service will follow while running. The above piece of code is used to host and start a server for the service that we have created. As you can see its just few lines of code to get our service started in a separate process and we don’t actually need to rely upon IIS server. Now when you start the application by pressing F5, you’ll get your server started and service endpoints listening to your request. We’ll test the end points with our own test client that we are about to create. but before that let us start our server. Compile the application and in windows explorer navigate to SelfHostedAPI.exe in bin\debug folder and run it as an administrator. That means our port is listening to the requests. Now that we know our services are up and running, its time to test them through a test client. You can use your own test client or build a one as a console application. I am building a separate test client in .net itself to test the services. Add a console application in the same or another solution with the name APITestClient or the name of your choice.We’ll use Program.cs to write all the code for calling WebAPI methods.But before that, we need to install a NuGet package that helps us in creating a HTTP client through which we’ll make API calls. This will install the necessary package and its dependencies in your test client project. All set , now we can write CURD calling methods and call them from the main method. The above method makes the call to “api/product “ endpoint via HttpClient instance and expects a result in HttpResponseMessage from service. Note that it uses the method GetAsync to make an endpoint call, this states that it is calling a Get method of REST API. 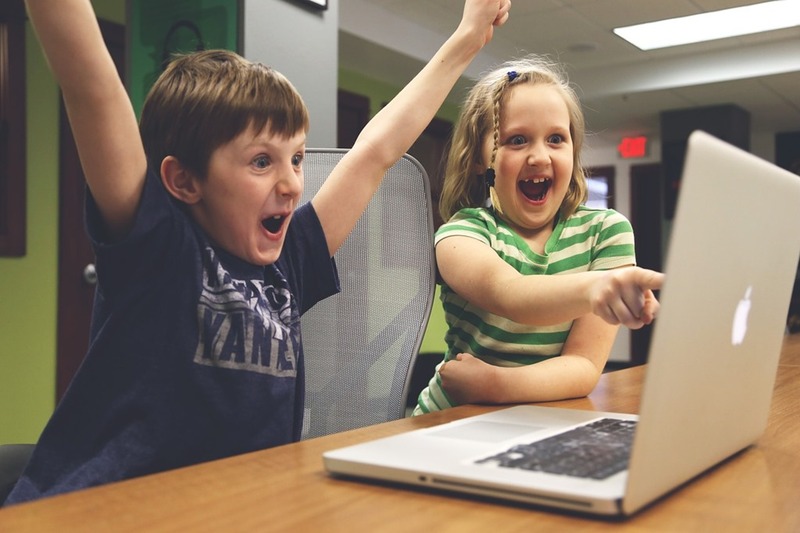 Hurray, we got all our products from database to this client. This proves that our service is well hosted and working fine. We can define other methods too in a similar way and test the API endpoints. This method fetches product by id. Hence, we get the result. 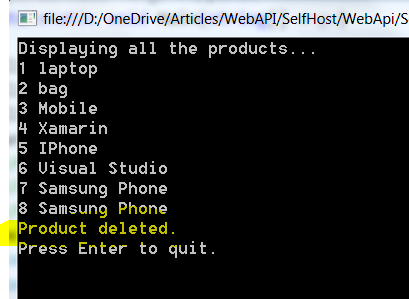 In above method, I am trying to add a new product named “Samsung Phone” in our existing product list. Since we have auto-id generation at the database, so ve don’t have to provide the id of the product.It will automatically get inserted in database with a unique id. Note that this method makes the call with a Post type method to API end point. Run the application. 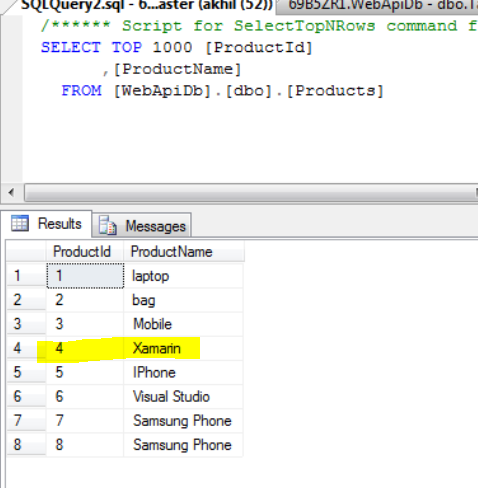 We see here that our existing product named Ipad is updated to new name “Xamarin”. We see that one new product has also been added with id 8, that’s because we again called add method from the main method , ideally, we would have commented it out while testing edit method . We see the product with id “2” as deleted. So , we have performed all the CURD operations on a self-hosted WebAPI. And the result was as expected. Following is the code for Program.cs file in consolidation. I have tried to keep this tutorial simple and straight forward, and explain each and every step through which you can create a simple WebAPI with all CURD operations using Entity Framework, and finally, self-host that API and test it.I hope you enjoyed reading this article. You can download the complete source code from GitHub.